When the weather gets colder outside, I start craving all the warm, comforting, cozy meals. Think chili, shepherd’s pie, and hearty dishes like eggplant parmesan (which is on weekly rotation in our household)! This is new my go-to crispy, gluten-free version that’s so easy to make, customizable, and insanely delicious. Let me show you how! This 10-ingredient recipe starts with thinly sliced eggplant. My original version required salting and rinsing the eggplant to remove bitterness, but having tested it both ways now, I’ve found that it’s an unnecessary step and one that adds too much moisture to the eggplant. 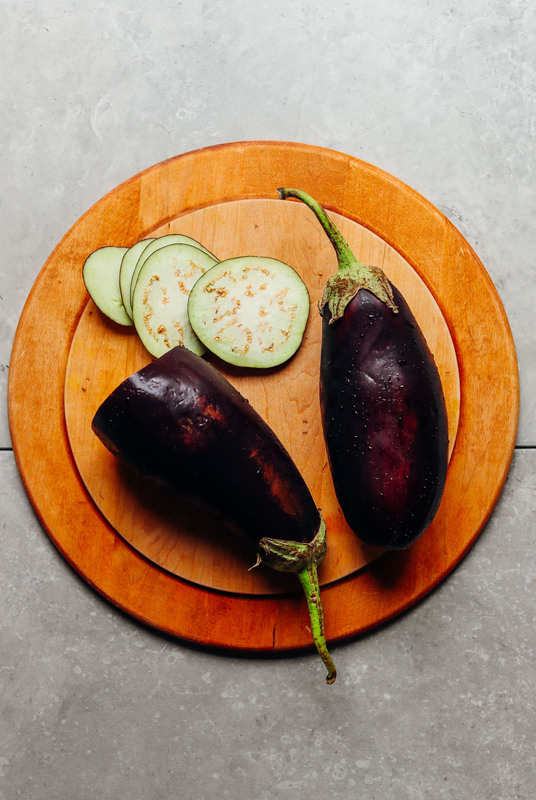 Especially when working with gluten-free flours and bread crumbs, extra moisture decreases the level of crispiness you can get on the eggplant. Plus, not salting saves time, meaning this dish is ready in about 45 minutes start to finish. The breading process is simple: Dust in gluten-free flour, dip in almond milk and cornstarch, and finish up with a mixture of gluten-free panko bread crumbs, vegan parmesan cheese, and cornmeal. 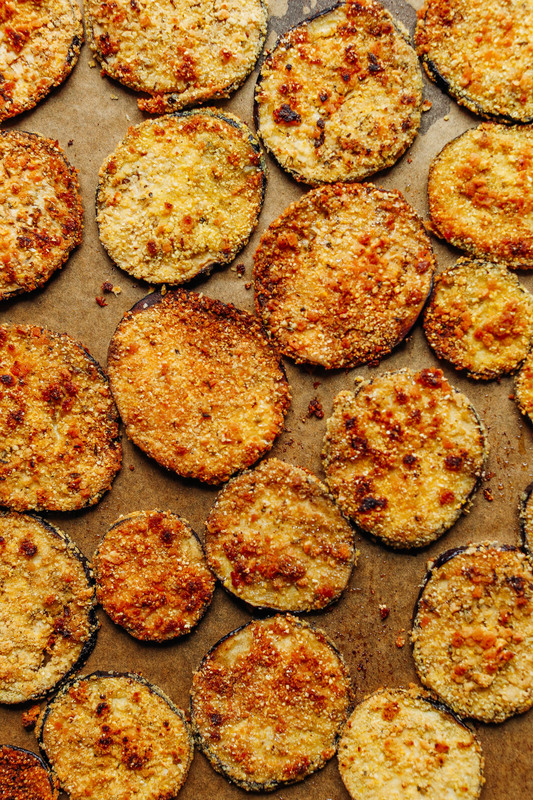 I’ve found this mixture to create the perfect breading for ultra-crispy eggplant rounds. Next, sauté over medium heat until light golden brown, and finish up in the oven until crispy. That’s it! This would make the perfect meal when you’re craving something plant-based but super hearty. 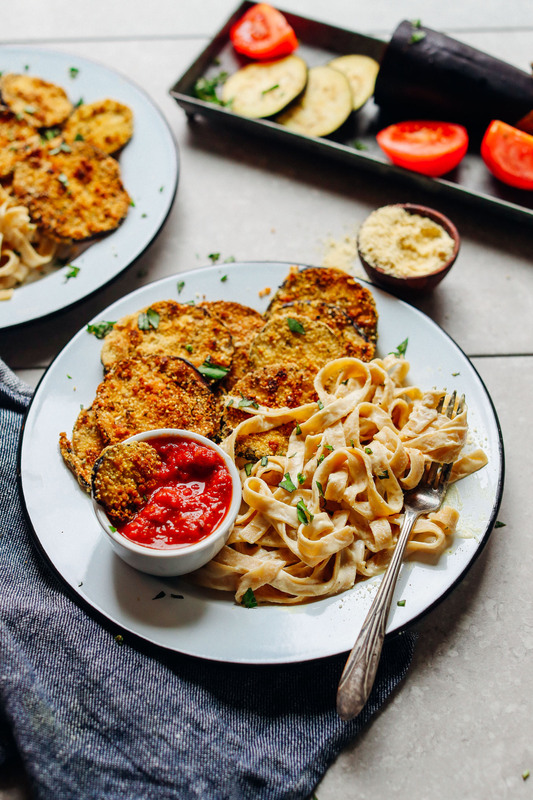 It even satisfies picky eaters with its crispy texture, hearty dipping sauce options, and the fact that it pairs so well with pasta (hello, carbs, I’m Dana and I love you). 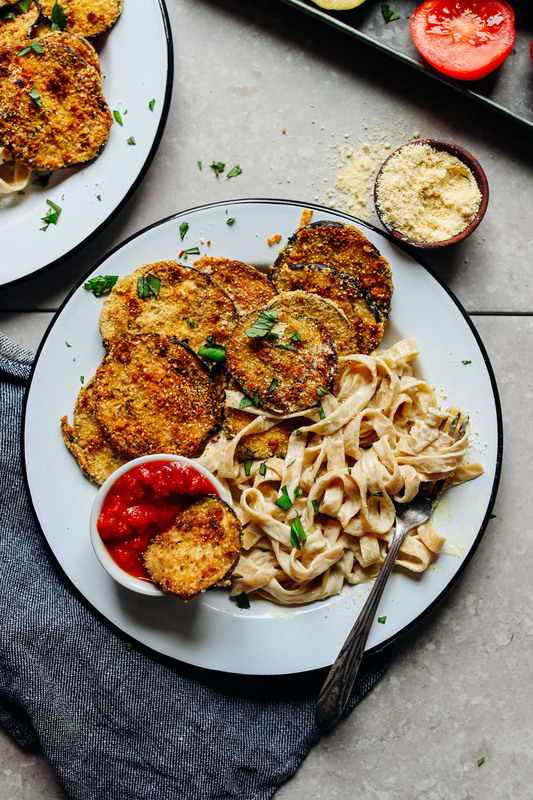 Crispy, vegan, gluten-free eggplant parmesan made with 10 simple ingredients! The perfect flavorful, plant-based entrée for Italian night! Preheat oven to 400 degrees F (204 C) and line a baking sheet with parchment paper. Also, prepare your dipping stations by mixing together almond milk and cornstarch in one bowl; gluten-free flour, cornstarch, and sea salt in another bowl; and gluten-free panko bread crumbs, cornmeal, vegan parmesan cheese, oregano, and sea salt in another bowl (see photo). If serving with pasta and sauces, prepare at this time (optional). Once pasta is done cooking, drain and cover with a towel to keep warm. Set aside. 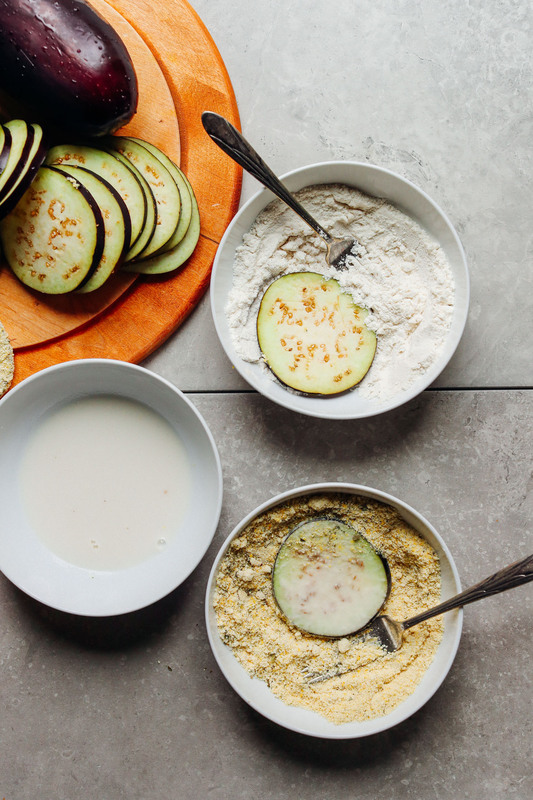 Next, dip eggplant slices in flour mixture, then almond milk mixture, and then breadcrumb mixture and arrange dipped rounds on a clean plate. Heat a large skillet over medium heat. Once hot, add 2 Tbsp oil (30 ml // as recipe is written // adjust if altering batch size). Let the oil heat for 1 minute. Then add 4-5 eggplant rounds at a time and brown for ~2-3 minutes on each side or until light golden brown. Then add to the prepared baking sheet, and add baking sheet to the oven so the eggplant can start baking. Continue browning eggplant in batches until all rounds are browned and in the oven, adding more oil to the cooking pan as needed and turn down heat if eggplant rounds are browning too quickly. 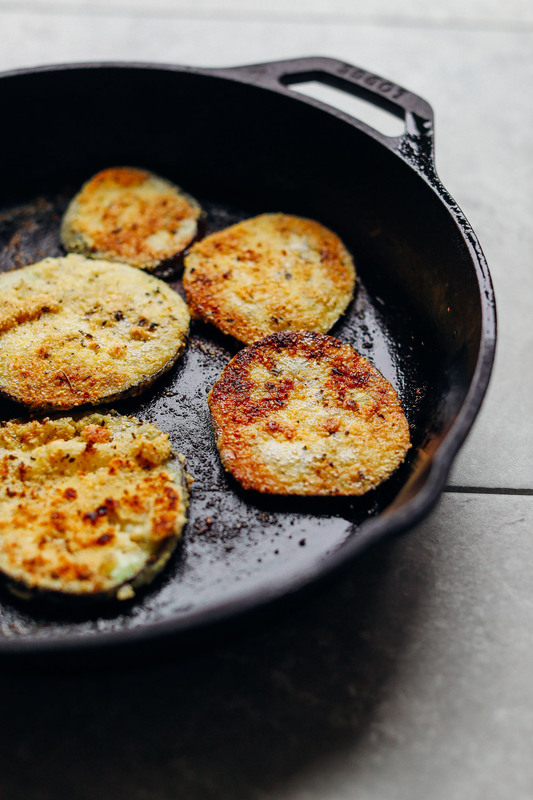 Bake eggplant for 10-15 minutes or until crispy and golden brown, flipping once around the halfway mark to ensure even baking. Then serve as is or with desired sides and sauces. Best when fresh. But you can store completely cooled leftover eggplant covered in the refrigerator up to 2 days. Reheat on a baking sheet in a 350-degree F (176 C) oven until hot. *You can also try using gluten-free bread crumbs, but panko bread crumbs add a crispier texture. *You can sub 2 tsp fresh oregano per 1 tsp dried. *Nutrition information is a rough estimate calculated with oil for cooking, and without additional sauces or sides. *Recipe adapted from my Vegan Eggplant Parmesan recipe. ← Announcing: Food Video School! I made this as the recipe is written except I used all purpose flour in place of the gluten free. Oh man! So delish! I cheated and served it over store-bought zucchini noodles (first time trying those) that I boiled for 1 min, drained, then sauteed in olive oil with garlic and a few halved cherry tomatoes. I also just used store-bought marinara sauce. We had olives off the olive bar on the side. Totally hit the spot! I will make this again. 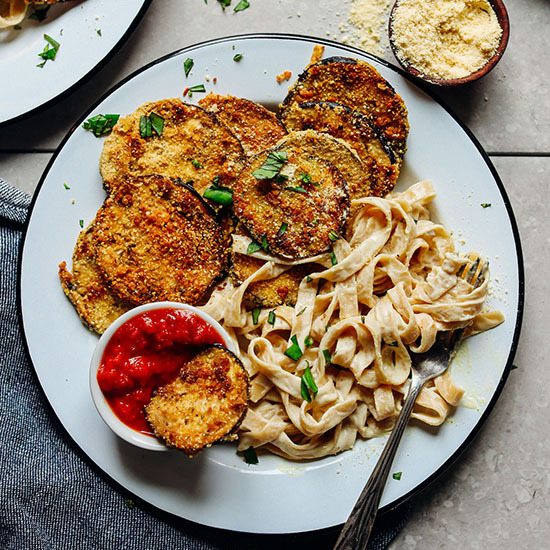 I haven’t read through all the comments yet but wonder if these eggplant cutlets could be made ahead and frozen (I can’t imagine why they couldn’t). Not just the best eggplant dish I’ve ever made, but the best eggplant dish I’ve ever had. FANTASTIC. Thank you. Why did you need to use neutral oil? Can I just use olive oil? I added nutritional yeast instead of vegan parmesan and used normal flour which was fine. Perhaps I didn’t put enough flour or maybe cut them too big cos some weren’t as easy to pick up and dip. Gobbled them up all the same :) a delightful tasty treat. SO delicious! I made this for my family for dinner tonight – everyone loved it! The only change I made was to swap in crushed Corn Chex for the panko bread crumbs since it’s what we had on hand. Served it over pasta with a homemade marinara on top. I have not made many eggplant dishes due to the salting prep usually involved, so skipping that part for this recipe initially drew my interest. However, I had high expectations since there were THREE dipping stations, and I’m happy to say that the end product was well worth it! Crispy, delectable eggplant rounds that even my children liked. We dipped them in marinara along with some linguine and cashew alfredo. Once everything is set up, the preparation is easy, so don’t let that deter you. I must’ve had a larger eggplant, because I had to re-make the almond milk mixture and the panko mixture to complete – so just be aware – you may need more. Very good! Hi! This looks great! Do you have a recipe for that side pasta? PERFECT. I added a spoonful of marinara and a slice of Violife cheese for the last few minutes of baking, then stuffed them into a ciabatta with more marinara on the side. Eggplant parm sammies FTW! Oh, now you have my attention! Must do this. Love, love, love this dish. We are trying to reduce a little of our fat intake. Has anyone tried this in an air fryer? If so temp and time? Thank you for another favorite on our family’s dinner table. We made this tonight for our family if 5 with your cashew alfredo over pasta. Everybody enjoyed it, even the picky eaters! Thank you so much for your recipes. Definitely saved as family favorite. Made this tonight for myself and my husband and it was a huge hit! My husband was already wanting seconds before he was done with his first portion. The eggplant came out sooo crispy and delicious!!! I forsee this recipe being a definite staple in our household. Thank you for an awesome recipe!!! Yay! We’re glad you and your husband enjoyed it, Kaylynn! Absolutely stellar recipe… so appreciative of your blog. The recipe is perfect as written. Thank you! Made this tonight for my two girlfriends, both of whom ‘hated’ eggplant until now…. it was amazing. We all devoured it. Crispy, fullsome, delicious. Thanks for the amazing recipes! I suddenly got motivated tonight to use up an eggplant that’s about to go bad, and I remembered this recipe. I did not have a key ingredient on hand – any kind of starch – but I hoped for the best and it still turned out amazingly. I skipped the starch altogether in both dipping stations, and also replaced the panko crumbs with “chickpea crumbs” (another GF crumb option), which are much chunkier, but definitely work. My favorite rounds for the delicious texture and crisp are the ones I cut slightly thinner – mine were not all even thickness – and browned longer in the pan beforehand . Adding to all the others raving about this recipe – it’s a keeper! We’re glad you enjoyed it, Amar! So delicious! My 3 y.o. asked for more. I used a Japanese eggplant, which was long and skinny. They also have less seeds. Can’t wait to make it again. Smart! Thanks for sharing, Amanda! I absolutely LOVE this recipe. I make it all the time. Instead of pasta I have it with Kale chips seasoned with Turmeric and Garlic Powder. So thankful I found this recipe!!! It came out perfect and delicious! I made this and we liked it a lot. My only regret is l wished I had made more, since it was a lot of work. But it is our new favorite way to prepare eggplant. Seemed like something we could do outside on the grill. Thanks for sharing! Hi! Can i bake the eggplant in the oven from the beginning instead of frying it? Thank you! Hi! We haven’t tried that, but it should work. If you give it a try, report back! I made this dish this week and I’ve got to tell you…I could eat this three meals a day for a whole year and not get tired of it. Hands down my absolute favorite meal. The ‘parmesan cheese’ is delicious! Even my non vegan Mom loves it! Can’t wait to make it again. Thank you so much! Could I substitute all-purpose flour for the gluten free flour in this recipie? Hi Dana, I made this last night and it was amazing! The texture of the eggplant turned out perfectly. Do you think this is something that would freeze well? My first thought is probably not? But we haven’t tried it and can’t say for sure. If you do, report back on how it goes! They were delicious! But too many steps to make. I would say that if you make them, double it, so it is worth the work. I have to say you need time for this one. Amazing and delicious dish! Thank you for sharing your artistry. For other readers, I didn’t cut my eggplant as thick and just cooked 2.5 minutes per side; no oven was necessary. The result was perfect for us – a little crisp around the outside and a soft inside. Yummy! Made it, loved it! My husband is a meat eater and quite weary of veggies. He tried some and then finished off half the baking sheet. This was the very first time I have tried eggplant. Thank you, Dana, for introducing me to something new and scrumptious! I made this for a family gathering, and everyone really liked it. It’s great to have an option that is both vegetarian and gluten free that doesn’t feel like it skimps on flavor. I did have one issue, though. When I fried the eggplant in coconut oil, it got really really smoky. We had to open doors and windows it was so smoky. Any thoughts as to why that happened? Otherwise, everything was great. THIS WAS SOOO GOOD! Made it for my boyfriend and I last night and it was a hit. My food processor broke so I didn’t get to make it with the alfredo sauce- Just marinara and pasta. But will definitely be adding this to my weekly rotation. Thanks for creating another foolproof recipe Dana! I’m completeley obsessed with your recipes and photos. I stumbled across you on instagram after becoming vegan and gluten free and while desperately trying to figure out what to cook and eat. I love cooking and you have inspired me in so many ways. Your recipes are simple, yet so delicious. I’m so grateful for YOU! THANK YOU!!! I’ve made the minestrone, pumpkin curry and eggplant parmesan and much more….all amazing! I made this last night and did not find it appetizing. Instead of 1/8″ slices, I cut 1/4′ slices and even that was not thick enough for me. With the 1/8″ it seems you’d have more of an eggplant chip. Maybe that was the intent. I did like the 3 step process and ingredients and will likely try this again with 1/2″ thick slices. I assume the reason they are baked is to make them crispier. Yes, it seems you didn’t follow the method I recommended. They’re definitely supposed to be crispy! I’ve been looking for these as well. It seems as if they only have them in the UK. Someone in the US better start making them! We made this for the first time the other night and it was DELICIOUS! Even our 14 month old babe couldn’t get enough. A few more steps than our normal dinner prep but totally worth it! Definitely a keeper :) Thanks for yet another awesome recipe! This recipe was so good!! It worked out perfect for my dinner party! This was the BEST and most CRISPY eggplant we’ve ever had! Thanks for a great recipe! Loved this recipe! Made it tonight (including the fettucine alfredo and homemade marinara sauce) TURNED OUT AWESOME. Has been added to the roster :) I totally forgot to add the breadcrumbs but I don’t think it affected the final outcome. It stayed crispy even after sitting for an hour or so. 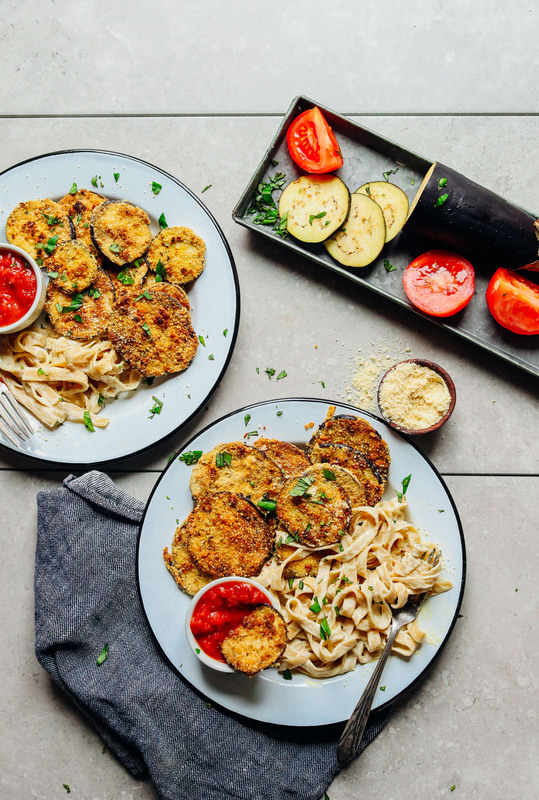 I made this recipe last night and I love these mini eggplant rounds! I’ve always made the long thin strips but these are a perfect alternative. Thank you for making life gluten free so much easier! I love these crisp cuties, excellent for dipping in the marinara sauce! Great texture and crunch. Another reliable recipe from minimalist baker, well done! I made this coating with zucchini strips and so delicious!!! Can’t believe I got that type of crunch with gluten free. I was lucky to find the Kikkoman brand gluten free Pablo, been looking for a while. Thank you, I will definitely make again! These are AMAZING! Love this recipe and so did my meat eating boyfriend. I tried to make the Alfredo sauce but it tasted too much like the mac and cheese recipe. Heated up the leftovers with some marinara for dipping- highly recommend! Oh. my goddess. Dana, I cannot even tell you how freaking amazing this was. I came home and realized my partner had bought an eggplant a few days ago and it was just on its last day or two before it was going to go back. I coincidentally had just received your newsletter email that same day, so I thought, “what the heck?” and whipped this dish up with what I had in my cabinets (didn’t have any cornmeal, so I just used more cornstarch). AND IT WAS AMAZING. Seriously. I cannot even tell you. We were both swooning and in complete heaven. We both agreed that this is THE BEST EGGPLANT that either of us have *ever* had. We loved it so much that we’re going out again tomorrow to get another eggplant to make it yet again. We’re going to use this recipe a lot in the years to come! Thank you, thank you! haha YAY! So glad you enjoyed it! Has anyone made this ahead — up until the baking point? Perhaps the time may change is they are baked cold from the day before. I was thinking of serving Christmas Day but don’t want to prepare then. Thoughts ? Side note: I just made them to try – excellent !! At first I fried in pan… I them got impatient and used the griddle. In LOVE! Sooo crispy and tasty. I added some nutritional yeast and pepper into the breadcrumbs. I made them up to step three (dipped and battered) and then I froze them. They kept very well! To reheat I panfried and baked them as per usual and they tasted just as good as the first time! My boyfriend and I love having this quick dinner/snack on hand. Mouthwatering !!!! Nice recipe i will try this. Just made this…absolutely delicious. Thank you. This looks delicious! But I’m allergic to corn. Did you have any success using just panko? Hi Beth! I suggested to others with corn sensitivities to mix more of the other two dry ingredients in place of the cornmeal. Let me know how it goes! This looks amazing! I’ll have to try this recipe! I made this last night with regular flour and bread crumbs and it came out perfect. :) They are delicious! Wait forgot to ask , did you omit or keep the corn meal? If I left out the cornmeal (and used the arrowroot starch instead of cornstarch), would they still come out crunchy? I can’t handle corn or corn products. Otherwise, it looks and sounds delicious! Thanks. It should still be crunchy! Just compensate with a mix of more of the other two dry ingredients. Thanks Dana, I can’t wait to try this. My family and I just decided to go Vegan and I just want to say Thank you for your recipes, they are amazing!!! I’m trying this one tomorrow with the homemade “ parm cheese” yay! Only eat the “male” eggplants if you don’t like the bitterness. It is the seeds that cause the bitterness and the males don’t have very many at all. Woah! Mind blown! Mine are usually bitter and I never knew why some weren’t and some were. I’ve never really liked eggplant, always thinking it was too bitter, maybe this is why. I’ll make this for my sister in law at Christmas and make sure I get a male eggplant. Thanks for the tip ? This is scientifically untrue. Nightshades have the ability to self pollinate and do not have made or female varieties. But this recipe is delicious. It has become my go to comfort food paired with the cashew Alfredo. The coating on the eggplant is perfectly crispy. Thank you! Thanks and excited to try out the new mix! Thanks Laura! Hope you love this one! OMG. Just added this to my “MUST MAKE” mental list! I was just trying to figure out how to make your other eggplant parm recipe GF for my mom for Christmas and then I wake up to this! YAY! Hi Linda! We have noticed a small bug with ipads and we’ve been waiting on an update from apple. That said, that’s been a couple months and they haven’t rolled out that fix yet. We’re working on an alternative option, but it’s likely a few weeks out as well. All that to say something should be fixed in the near future! The print function should work on a computer if you have access to that. hope its solved soon. I can still print them, but it’s a bit more time consuming than id prefer. love your recipes! It works on mine, good luck ? I am a Celiac and always looking for new recipes. Eggplant was on sale at the grocery so I bought one. In short your recipe was TERRIFIC!! My husband and I ate the whole plate. By the way my Gluten Free Chex mix recipe was in last June’s Gluten Free magazine. I am Vicki Thank you very much! !